The Library and Resources page offers reading material, audios, videos, blogs and more to help you. To make it easier to find and access these resources, they have been collected into some major topics (roles, practices, transformation, books, papers, and artifacts) and subtopics. These are some of the primary disciplines and practices involved in Lean-Agile. Most disciplines and practices involve more than one role. Reading Paths provide guided explorations of critical topics to speed your learning. There are reading paths for the roles of Lean-Agile and Reading Paths for some of the specific important skills required for Lean-Agile, skills which might span several roles (such as facilitation or decomposing requirements. 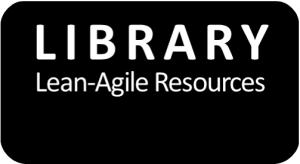 A helpful set of readings, papers, and documents to help you in Lean-Agile. Categories include a Glossary of Lean-Agile Terms, Lean-Agile Executives and Transformation Agents, Management, Becoming Lean-Agile, Product Portfolio Management, Team Agility, Technical Agility, and Leanban. The delivery of value involves the effort of people from all across the value stream: executive, management, and front line teams. People from the Business and technology work together to discover and deliver work that customers can use and can realize value from it. This provides links to a great set of technical resources on the Net Objectives website. Transformation involves a shift in practice and social behaviors and organizational structure to move use from where we are now to where we want to go. It is a years-long journey and involves support from all across the organization. The goal is to realize the highest level of Business value in the quickest amount of time sustainably. The portal offers a number of tools and approaches to help guide and coach the transformation including Guardrails and the Inflection Point System for deciding among transformation options. Net Objectives hosts regular webinar series to explore important topics in Lean-Agile. These 50 minute sessions provide important background to help you in the journey.